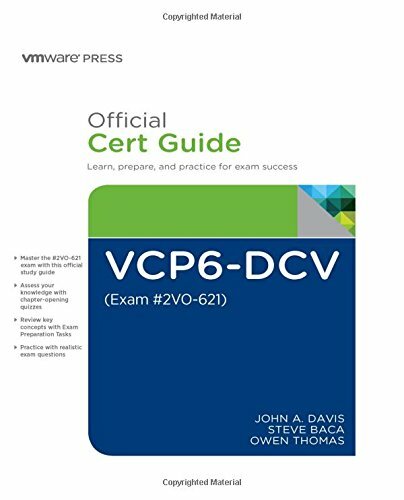 VCP6-DCV Official Cert Guide focuses specifically on the objectives for the VMware Certified Professional 6 — Data Center Virtualization (VCP6-DCV) #2V0-621 exam. Leading VMware consultants, trainers, and data center experts John A. Davis, Steve Baca, and Owen Thomas share preparation hints and test-taking tips, helping you identify areas of weakness and improve both your conceptual knowledge and hands-on skills. Material is presented in a concise manner, focusing on increasing your understanding and retention of exam topics.